You could try a different cartridge – any small international cartridge should fit. 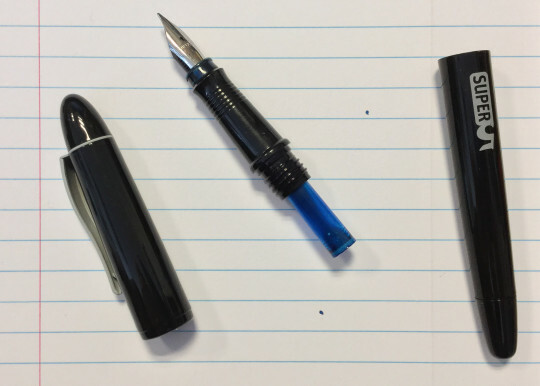 Alternatively, if it’s the section which is to blame, you could swap the nib into a Manuscript Master or a big Dex, both of which use the same (Helit) body. Scribble, thank you for your comment. I will use another cartridge next. 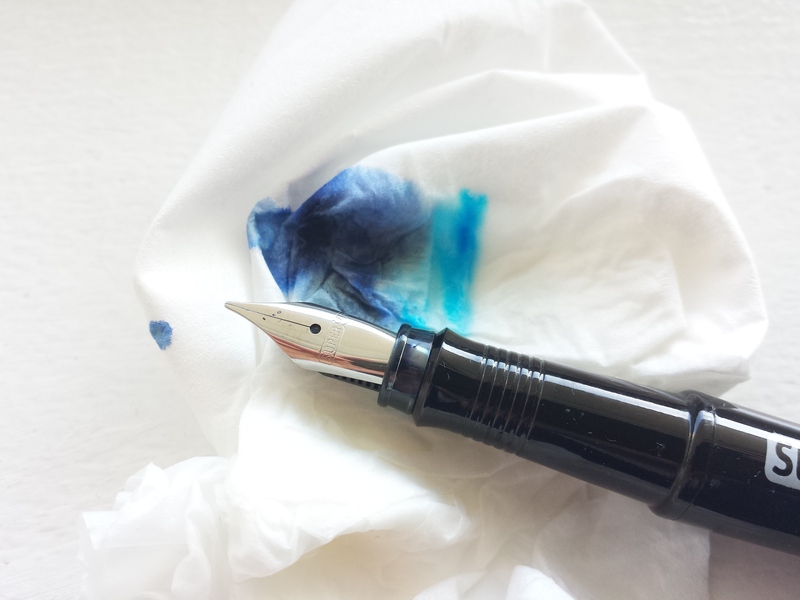 I was wondering whether someone else had the same problem, that would strengthen my hypothesis that capillary action drew the ink u between the cartridge and grip wall – just because I can’t think of another reason. I don’t have any of the other pens you mentioned, but I like the Super5’s body very much, so probably wouldn’t want to swap anyway. Matthias, my hands never got inky but I did notice residual ink even after cleaning. I usually clean my pens pretty thoroughly so that was a surprise! Below you can see how the earlier turquoise ink seeped out together with the navy blue then in use. My uneducated guess is that the ink gets trapped in some undefined part of the grip section… The part where the grip connects with the converter/cartridge gets messier than usual too. Oh I use a converter BTW. Sola, thanks. Hmm, I wonder why that is. I used another cartridge, clean pen, clean cartridge, and after a few days I got exactly the same problem. I start to think the Super5 is maybe another ‘desk pen’, not an everyday carry pen. What a shame. So far I haven’t encountered this problem, neither with a cartridge nor with a converter. Yesterday I spoke with Robert, the man behind the Super5, about it, and he told me that if this problem persists you will get a replacement. That is very kind – checking for me and the offer of a replacement. I will try another cartridge. It seems an odd behaviour I haven’t had with any of my other fountain pens (and I do have much more than I should) – I still think it’s just an unlucky cartridge diameter or something like that.. If I need to I will happily get back to you. Thanks.